Indications: Blocks histamine-2 to reduce stomach acid production as a treatment for sour stomach and acid indigestion. The medication may be prescribed for other conditions as your physician sees fit. Summary Recommendations: Pepcid Complete is a combination of Famotidine, magnesium and calcium. The medication should be taken as directed for no longer than 14 days. If you have chronic heartburn lasting more than three months, consult your physician before taking this medication. General Precautions: Pepcid Complete is an over-the-counter medication, but that does not mean the medication is safe for all patients. Patients with a history of allergic reaction to Famotidine or similar medications like Nizatidine, Cimetidine and ranitidine should not take Pepcid Complete without consulting a physician first as an allergic reaction could occur. While using Pepcid Complete, if you experience stomach pain, weight loss, difficult breathing when heartburn develops stop taking the medication and seek medical advice. Never take Pepcid Complete with other medications, either over-the-counter or prescription, designed to treat heartburn or similar conditions. This includes antacids and other Pepcid products. Some patients notice improvements in heartburn when taking Pepcid Complete in conjunction with lifestyle changes. Changes often include eating slowly, eating more frequent small meals as opposed to larger meals, weight loss and skipping late night snacks. Symptoms of heartburn may be caused by smoking, so stop smoking if possible to help relieve symptoms. Effects While Trying to Conceive: When Famotidine was given to rats via oral (up to 2,000 mg/kg daily) or intravenously (up to 200 mg/kg daily) there was no negative impact on fertility or reproduction. Famotidine is one of the three ingredients in Pepcid Complete. There have been no human studies completed on Pepcid Complete. 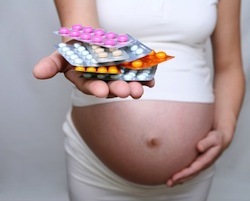 Effects on Pregnancy: Pepcid Complete has not been tested for safety during pregnancy. The potential effects on pregnancy and/or the fetus are unknown. If you find out you are pregnant or plan on becoming pregnant and you are currently taking Pepcid Complete, stop taking the medication and speak with your physician about safe medications to treat acid indigestion and sour stomach. Safe During Breastfeeding: Famotidine, an ingredient in Pepcid Complete, passes to the infant in breast milk. Animal studies have shown depressed growth at doses 600 times that typically prescribed to or taken by humans. Due to the potential for adverse side effects, caution should be taken when breastfeeding. Talk to your physician about the benefits and risks of using Pepcid Complete while breastfeeding before taking the medication.